Sonu Lohat son of Late Sh. Ram Kumar--- born in April 1976 at Hallu Mohalla Bhiwani (Haryana). Studied at Govt. school, Vaish college, Govt. college Bhiwani and Kurukshetra university Kurukshetra---did M. A., B. Ed., M. Phil., UGC-NET in the subject of English. Taught at some schools, institutes, colleges besides at. Dept. of English Ch. Devi Lal University, Sirsa. 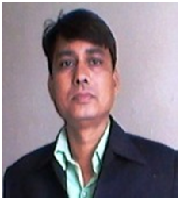 Presently working as Assistant Professor of English since July 2006 (at govt. colleges) with Higher Education, Haryana. Also pursuing Ph. D. from J. K. Lakshmipat University, Jaipur under the able supervision of Dr. Sanjay Kumar. There are five papers published so far particularly one in-- International Journal of Linguistics & Communication (March 2014 vol. 2 No. 1) ARIPD, New York USA. Also presented papers at National Seminars. Written articles at certain blogs and sites. At present live in Sirsa (Haryana). Have great passions for creative literary writing and planning to write a novel in future; owing to that promise keep pre-occupied with ideas, concepts, philosophies, shades of reality etc. that shape the life. certain literary poems have been published in magazines.